Note that, if the Member has no email address on file, the option to email the receipt will be greyed out. Note that, if you want to default to an email receipt for an individual customer, edit their email address in option 4.4 (Member Database), field 9, confirm the existing email address and then answer [Yes] to the prompt that asks “Does Member Prefer Emailed Sales Receipts?” This makes “Email Receipt” the default choice at the register for this Member. Backing up is essential for data security. To make backing up easier, an automatic backup and shutdown option has been added in CoPOS. You can now set up a schedule to back up and then shut down at a specified time every night. This feature has the added benefit of improving performance. CoPOS has found that the system runs better when it is shut down on a nightly basis. Setting up automatic backups is done through the CoPOS controller. To set up the schedule, and which functions will be done in the backup, select Automate Backup from the Backup menu. This is one of our most important new features. Working with over 60 stores around the nation, CoPOS has seen a wide variety of natural disasters and hardware failures. A good backup will enable you to be back up and running swiftly. Upon successful completion of a backup being written to the USB flash drive, CoPOS will send an email that states the date and time of the successful backup. The email will come from the account “no-reply@copos.com.” If no email is sent, the backup was not successful. CoPOS also lets you set up a Loyalty Program in which individuals can earn points whenever they make a purchase. These Loyalty Points can then be redeemed at later sales. In addition, reporting on accruals and usage is available. The store can add a logo to the credit card machine. This new version has been running for a many months at a handful of locations and we have gotten nothing but positive feedback. When making your selection from any Item or Member List, you will be prompted for a cutoff date. If a date is provided, only those Lists created on or after the specified date are shown in the selection box. This is an easy way to reduce the number of lists to sort through. To create the report, select 3.12 from the Main Menu. Note that Options 12 and below shifted down one. CoPOS training mode is even better now, providing the trainee an opportunity to learn on your CoPOS system while in a “safe” environment. The Training Mode, which is completely separate from the “live” environment, provides most functions that are available within the standard CoPOS system, the exceptions being imports and exports. To access Training Mode: At the Username prompt, enter Username train. CoPOS now lets you set up one of the many USDA administered incentive programs, for example, Double-Up Food Bucks and Fresh Savings. All of these programs work by accruing monies when purchasing eligible Items using EBT. Users can then redeem a specified percentage, up to a given daily amount, when purchasing other Items at a later sale. CoPOS lets you enroll Users, establish the eligible Items along with the percentage off, maximum usage amount and any Department restrictions. Monthly Statutory reports are available. A similar breakdown is shown for the Summary and Detailed Sales Tax options (3.3 and 3.4). These release notes cover all the changes made since the release of version 4.0A on December 28th 2016. To download a PDF version of these Release Notes click here. To download the latest CoPOS (COA 4.1) Release click here. CoPOS is excited to introduce integrated electronic invoicing direct from UNFI into CoPOS through the CoPOS Cloud. No more need to use a flash drive or any other computer. The invoices show up directly in options 8.7 Process Electronic Invoices and 8.1 Enter Item Prices. This feature has been previously available from select UNFI distribution centers but is now available on any UNFI account that uses the CoPOS POS system. We have been testing the integrated electronic invoicing in a few locations across the country for the past four months and UNFI has been able to resolve the issues that we have noticed. That said, this interface is still in beta and it is recommended that you continue to check, both your integrated electronic invoice and your paper invoice, for any discrepancies during the first month of utilization. CoPOS now supports a delivery charge. A delivery charge can be added when selling a special order or an online order at the register. Delivery charges are added by entering “.DC” in the item column of the register. If a default delivery charge has been set up, CoPOS will display it in the price column. If an open ring delivery charge has been setup, CoPOS will prompted for the dollar amount. The CoPOS menu option 4, Database, has been cleaned up to remove the extraneous verbiage of “Enter/Edit/List/Query.” The new wording continues to distinguish the options that allow user queries. Those are option 1, Item Database and option 4, Member Database. Members or customers that have special orders and come to the register can now be looked up by using their order number. To pull up the member or customer using their order number type O/### in the Member Field of option 1.1 “Record a Sale”. 1) The Item Code is a Number that is seven (7) digits or less. 2) The Item has an Alternate ID and that Alternate ID is twelve (12) digits. Controls whether Dietary Guides are displayed on Repack Labels. When shown on Repack Labels, Dietary Guides appear at the bottom of the area reserved for Item Ingredients. Controls whether inventory QOH (Quantity On Hand) levels can be edited in a tabular fashion from within CoPOS. This editing is done using the Multiple Items/ Single Field function of option 4.1, Item Database. Controls whether the 3 x 3 Single Perforation labels or 3 x 4 Dual Perforation labels are to be used as Expanded Labels. Controls whether the [Backspace] key behaves like the [ESC] key when pressed at the leftmost position in a field in the Text Editor. If this System Constant is is set to “Y” this will be the case. Otherwise, there is no change in the behavior of the [Backspace] key. Note: In the Spring of 2017, the [Backspace] key was made to function like [ESC] while in boxes and elsewhere in CoPOS. This System Constant was created in case stores were concerned about inadvertent exits while ‘leaning’ on the [Backspace] key in a field in the Text Editor. Controls whether a second form of Repack Label is produced. This second form shows pricing for BOTH Non-Members and Members. This form is not available on the dual perf labels (LPQ07 stock) due to size restrictions. Stores that offer generous Member Discounts might consider using this form. These release notes cover all the changes made since the release of version 4.0 on November 9th 2016. CoPOS is releasing this minor update to resolve a bug found in option 6.11, Reduction/Transfer (Multiple Items). This option is now recording reductions and transfers correctly. Please update CoPOS before using this option for your end of the month spoilage or transfers. This update is highly recommended for integrated credit card users as it fixes a rare issue with voiding a credit card sale. If you are using Integrated Credit Card processing, CoPOS now provides the ability to reverse a credit card charge without voiding a sale. This option is password protected and not easily used. Please contact CoPOS for further instructions. Discount by Department to Sell Items at Cost or at a Fixed Percentage Above Cost. It is now possible to set a discount to indicate that an entire department is sold at cost or at a fixed percentage above cost. This is controlled by System Constant #251, “Allow ‘Cost plus’ Pricing on a Per Dept Basis” and, indirectly, by System Constant #36, “Allow Differing Member Discounts by Department.” The discount is assigned in option 4.5 “Membership Type Enter/Edit/List” in the option “Specify Department Specific Member Discounts” To specify this discount, enter the syntax “COST” or “C”+nn where “nn” is the percentage over cost. This discount can be specified per department and if no discount is specified for a department, the basic member discount will be used for that department. By entering zero, you can effectively exclude departments from the basic member discount using this option as well. Controls whether Bag Charges/Credits of $0.00 are permitted at the Register. Some stores wish to allow a $0.00 Bag Charge/Credit in order to count the #Bag Credits/Charges (via the Sales Query) without imposing any charges or granting any credits. Controls whether the Achieved Margin Column (Col L) of the Item Movement File Export looks at 24 Months instead of 12 Months. These release notes cover all the changes made since the release of version 3.6.5B on January 13th 2016. To download the latest CoPOS Release click here. CoPOS is planning on removing field 4 “Member Day Discount Supersede ALL Other Discounts.” from option 7.3, Fixed Member Day Sales. Please contact CoPOS immediately if you are currently using this field. CoPOS has successfully integrated credit card processing. The first system has been deployed for over two months and is running well. The second installation was a month ago. If you are interested in adding this customer service and bookkeeping friendly option to your store, please give us a call to find out how to make it happen. We are working with Gravity Payments to process the transactions. You might remember Gravity Payments from news reports citing the company for voluntarily raising their minimum wage to a truly livable wage for the Seattle area. You can now print Shelf Tags on LPQ05 stock without having to switch Device Types in CoPOS. Instead an additional prompt is asked seeing if you wish to print Shelf Tags on LPQ05 stock. If this prompt is affirmed, the printing is rotated to accommodate LPQ05 tags. Whether or not this prompt is asked at all is controlled by a new System Constant, #256. The Error Log can now be viewed from the CoPOS Main Menu or by using option 9.14, System Logs. At the CoPOS Main Menu you can type “ERRORLOG” or “Error Log” to view the error log. Support at CoPOS may ask you to do this from time to time. After viewing the error log you can use the Ctrl P option to print the log to a PDF document and send it to CoPOS or print a paper copy. Stacked sales occur when an item is put on sale for a specific timeframe and than the same item is put on sale again for a different timeframe. It gets very confusing if the timeframes overlap or one timeframe is completely within the second timeframe. Another complication comes with current sales and future sales. There are many different scenarios that need to be accounted for and CoPOS has improved the handling of these scenarios greatly but there are still some complicated situations that it can not handle. To be absolutely sure the sale works as expected, CoPOS currently recommends only putting an item on one current sale and one future sale. Please give us a call if you have questions regarding stacked sales. It is now possible to directly specify a Department Number to use when filtering items in many options in CoPOS. Instead of saying Yes or No to filter by departments and than specifying the department in the pop up box, simply type in the number of the department you want to filter by. 1) Select the choice bar option [Price Chngs] in the item profile. 2) Select [Last Mon On Sale] to see the last month that an item was sold while set at a price reduction. CoPOS also displays the number sold during that month as well as the number sold while on sale during that month. The Member Only Price and Single Item Price are now shown on the Item Profile to the right of the SRP. Single Item Prices are followed by an “S”. Member Only Prices take precedence when an Item has both a Single Item Price and a Member Only Price. 2) The initials of the user who inactivated the Item. If User Security is turned on, the initials of the employee who logged in are recorded. A new System Constant (#270) has been introduced which controls whether the entry of initials is required. Inventory Metrics depend heavily on both Periodic Inventories and correct Item Cost information being on file. *Turn/Earn index is your Gross Margin x Inventory Turns. For example, if your inventory turns 5 times in a year and you have a 35% margin your Turn/Earn index is 175 (35 x 5 = 175). The Turn/Earn Index will help you balance turnover and profits. It highlights situations where high margins can compensate for low inventory turns or high inventory turns can compensate for low margins. When an Item is on both General Sale and Member Only Sale, it is now possible to specify that the Member Only Sale is x% reduced from the General Sale. Do this by entering the percentage off, followed by “%S”. Example, if an Item is on General Sale for 3.99, entering 10%S yields a Member Only Sale Price of 3.59. Shelf Tags now show Member Price in the same font as Base Price when electing to show Member Only prices on shelf tags. This should make this type of layout easier to read. 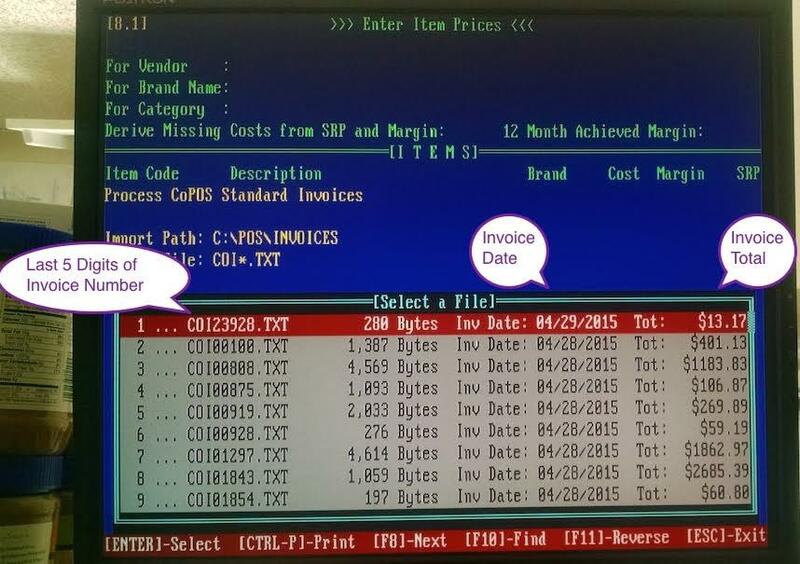 Sales queries, option 1.8 in CoPOS, have long been a resource in CoPOS to find out who bought what and when. CoPOS has now increased the usefulness of this option by allowing an item query from within a sales query. For example you can now run a sales query for all the register sales (baskets) that included local items sold in produce last month. Before this update you could see all of those sales and all the items sold in those baskets but there was no way to view only the local produce items sold in those baskets. Now you can. It is now possible to run and display the results of an Item Query when viewing a sale. The scope of items in the query are limited to those purchased in the specific sale being viewed. For example if you are looking at a sale to a customer that includes 21 items and you want to know which items in that basket were EBT eligible or local or from a specific vendor, you can now query for any or all of those attributes and any attribute in a normal item query. When using the option “Clock” to clock in and out, it is now possible to view the specific hours and total hours an employee worked both for the current pay week and the pervious pay week. This is in addition to the option to view the “Past 30 Days” that already existed. CoPOS now supports some of the laser printers from the Brother company. If you have a Brother model you wish to use, contact us at CoPOS. Currently, we know printing works on the Brother HL-L2360DW which is a WIFI / Network printer and can be used with other office computers as well as CoPOS. CoPOS has added a new format to export membership information. The new format is called the “Standard with 12 Payments” and it includes 12 separate payments instead of just the 6 currently available on the standard formate. To allow room for these payments it dispenses with many of the columns found on the standard member export format. At some point in the near future, CoPOS will provide an option that loads payment history from that file. When purchasing items at the register that can be sold both as a single or a full pack, for example grab and go soda, the cashier can now be prompted to chose Single or Pack. The issuance of this prompt is controlled by a new System Constant, #268. You can now enter “F*” in the Payment Method section of the register in response to any Payment Method. Entering “F*” lets CoPOS determine which Items are eligible for EBT and pay for these eligible Items via EBT. An Item’s Location can now be viewed from within a register transaction without the need to suspend and recall the sale. If Item Locations are maintained in CoPOS (highly suggested), this feature allows Cashiers to inform customers where an Item is likely to reside. To view an Item’s Location while Recording a Sale, enter “.L” in “Item Description” Column. It is now possible to easily weigh containers at the register without actually entering Items at the register. Simply put the container on the scale and type the “-“ key into the Member field and the weight is returned. A key to the Green Fields has been added to the receipt when green information is displayed on the sales receipt. It is now possible to run an Item Query from within a Sales Query with the scope limited to the Items in the qualifying Sales and ONLY display the qualifying Items. It is now possible to run a Sales Query for All Members who are Current or All Overdue Members. Please note: A new field has been added to the file that records specific sales in CoPOS. This new field indicates whether a sale was made to a member who is overdue at the time of the sale. There is no way this information can be captured retroactively. Consequently, this new feature only works for sales queries done on sales after this version is installed. It is now possible to restrict the credit card transactions displayed in this option to a specific register session if the report is ran for one day and a single register. It is now possible to edit the Receipt Message from any CoPOS station using this option. When editing from a CoPOS station other than the server, the user is prompted for a password. This password is initially set to the default password. After running this option from a remote station, the password can be set in option 10.11.7 “Set Default Passwords”. It is now possible to have the cash drawer open when using this option to count money. If the store requires a password to open the cash drawer, this same password will be required when using this option. To turn on this feature use System Constant 264. CoPOS has added a Sales History Report which presents the sales history of the store on a yearly basis from the time CoPOS was installed. The report includes all the information currently is available on page one of the Sales Recap Comparison report. The user can flip through the years and see how things have changed or export the information to excel and analyze it further. To view this, select the [History] option on the choice bar. This report is also available in option 3.1 Sales Recap using the [History] choice bar option. CoPOS now has an Option for viewing Consignor Take. We have provided Sale/Return Level granularity along with choices to View the Consignor, Item or Sale/Return with this Option. It is now possible to print Repack Labels that contain ONLY Ingredients — nothing else. This is controlled by a new System Constant, #258. It is now possible to exclude Special Order Sales (items sold as part of Special Order) from the data in Option 3.19 (Daily Sales For ONE Item). Added the capability to summarize the information in this option by week. When the report is consolidated by week an indication on the screen is shown. It is possible to toggle between the normal per-day display and the weekly summary. It is now possible to exclude sales figures for Items that sold as part of a Special Order. This report now shows the Total $Cost at the top of the screen and lets you toggle between viewing $Profit, #Cost and Inventory Information. Toggling is done using the [Rt Col] tab of the choice bar. Items shown in the Sales (Movement) By Month that are missing their Cost, show an asterisk (“*”) after their cost with an explanation in the header about Derived Costs. It is now possible to have CoPOS return the next available PLU# when in either the Add or Edit sections of this option. Do this by entering “.PLU”. When this is done, CoPOS prompts for the value at which to begin looking and will return the next available PLU after your response. It is now possible to query by the percentage of the #Items sold while on sale over a range of months. This is done in the Item Query via the Sales History. A new prompt has been added that lets you restrict Items by the percentage sold while on sale. This prompt is only issued when using the #Sold (vs the $Sold) and is the final prompt of the sequence. Both the Item and Member Query now have the capabilities of respecifying criteria values for Existing (Saved) Queries. This is done via a new choice bar option [Respecify Criteria Values] that displays after you select an Existing Query. It is hoped that having this feature will reduce the number of saved Queries, since a saved Query can now be reused by simply restating the values of the criteria that comprise the Query. It is now possible to view more detailed pricing information when using the choice bar option to [View] an item in option 4.1. Most importantly the Case Cost is now accessible to view in option 1 … Price Reductions/Pricing. When viewing the Sales History using the “Rightmost Column” of an Item Query, it is now possible to select between viewing the total of sales before or after member discounts. It is now possible to query by the percentage of the #Items sold while on sale over a range of months. This is done in the Item Query via the Sales History. A new prompt has been added that lets you restrict Items by the percentage sold while on sale. This prompt is only issued when using the #Sold (vs the $Sold) and is the final prompt of this sequence. It is now possible to search for Items with frozen SRPs. This is done in the Item Query via a second prompt when the Item SRP is selected as a criteria. Changed the criteria “Future Price Change” in the Item Query to “Future Pricing Changes.” Added a prompt within that field to select SRP Only, Cost Only or Both SPR AND Cost. The following criteria fields now accept the “less than” modifier and ranges: Sales History, Returns, Spoilage (SRP), Spoilage (Cost), Special Order Purchased, Achieved Margin, Profit, COGS (Cost of Goods Sold). This provides a better way to identify movements and trends. It is now possible to delete all Item Categories that lack attached Items. This is done by using the choice bar option [Delete], then the option [ALL Categories With NO Items]. It is now possible to export all items in a specific Item Category from within this option. This negates having to do this via the Item Query. CoPOS now has a way to export an owner/member’s first and last names in separate columns. This has been a much asked for feature. There is now a seamless transfer of owner/member information from CoPOS to Mail Chimp without having to use Excel or even rename the file. This new feature allows the marketing department/person to easily import first names into your promotional emails and other online and print promotions. The two new columns for first name and last name have been added to both the Quick Member Contact export and the Member Addresses export which are available in various options throughout CoPOS. CoPOS now makes it possible to import information from the Quick Member Contact export file. It should be noted that the columns “Name #1 (First)” and “Name #1 (Last)” cannot be imported directly but can be updated by changing the name in the column “Name #1”. Overdue members now show an “(O)” affixed to the member name when displaying members in a member query or other options that display members in tabular fashion. Currently, the member lookup does not show this. It is now possible for a membership type to grant an additional percentage discount to be taken off of an item on sale. The actual percentage off is controlled by field 3, “Basic Member Discount %” and are considered part of Basic Member Discounts. This feature is enabled by a new System Constant, #273 and is intended for those stores that grant Members a specific additional discount from the sale price of an item. Employees can be imported from a file template in a way similar to Members or Items. The template is available on the CoPOS website (www.copos.com) under the [Download] tab. Items on an Item List can now be exported into Excel in the standard CoPOS Item Template format. Options 5.10, Special Orders and 5.11, Special Order Sheets have been consolidated into Option 5.10, Open Special Orders with no loss of functionality. A choice bar option [Print/Export] has been added to option 5.10 for printing Open Special Order Sheets. It is now possible to set multiple items to have a zero periodic inventory count. Useful for stores running active inventory. It is good practice to set the periodic inventory count to zero before importing or scanning the periodic inventory. This prevents the possibility of an item keeping an erroneous active inventory count after posting periodic inventory counts to active inventory. To do this, enter “0*” when you [Specify QOH]. Added the ability to enter weights for items sold by the ounce. When an item is sold by the ounce and the inventory count is done in ounces, the cost and price valuations are now correct. The Cost Differential has been added to the print section of the Inventory Differentials Report. It is now possible to attach a note to a Reduction/Transfer made in 6.10 after responding “Y” to the “Increment/Save” prompt. It is now possible to enter multiple transfer incidents for any incident type via option 6.11. The names of the menu options 6.10 and 6.11 have been changed to reflect this. It is now possible to print out a list of the items being transferred or spoiled using this option. This can be useful for the deli to calculate the total cost of items being used in a recipe or to quickly generate a paper record of a spoilage event. This new report displays spoilage information for each departments within a specified date range including the cost of goods spoiled and the spoilage percentage for each department. You can also drill down to get spoilage information on a per-day basis for each department and from there you can view the actual spoilage incident including who spoiled the item and any spoilage notes that were entered. The spoilage percentage is defined as the ratio of the “cost of goods spoiled” to the sum of the “cost of goods sold and spoiled” and is reported as a percentage figure. Provide an alternative set of columns for displaying the item’s Qty/Case, item’s SKU number, current quantity on hand (QOH) and recommended number of items to reorder. The printed report has been updated as well and now includes the number of cases to reorder. This new screen appears automatically when the option to “include only items whose QOH is less than their quantity low level” is set to yes. You can also manually display this screen as well. These enhancements will facilitate ordering with the Scan Genius and iUNFI devices. Item ingredients can now be imported en masse from excel using the CoPOS Ingredient File located on our website or from the Label segment of the CostGuard application. 2) The Qty/Case exists in this file. CoPOS uses the Qty/Case in the pricing file but if that is missing CoPOS looks up the missing the Qty/Case from the #item/case field for that item in CoPOS. When changing pricing information from an Invoice or a CoPOS pricing template, it is now possible to reset ALL Costs, Margins and SRPs back to their Original Invoice values. It is now possible to take a percentage off a Sale Price in Option 8.2. This is in addition to the feature already in place that lets you take a percentage off the Base Price. To specify this, follow your response with a “%S”. Example: “10%S” takes 10% off the existing On Sale Price. Note, if the Item is not on sale, the Sale Price is skipped. CoPOS now supports the Co-op Deal file (previously known as CAP) supplied by NCG through LBMX. This option was called “View Future Price Changes.” The name has been updated and this option now has the ability to view cost changes as well as price (SRP) changes. Having this in conjunction with the future pricing changes in the Item Query will provide an easy way for users to monitor en masse changes that come in from places like the BID file, distributor catalogs or invoices. An option has been added to sort the shelf tags to be printed in the order in which the items were entered either from a List or when adding items one at a time. Option 9.4 Enter/Edit Device Table was replaced by these two options. The functionality was split between option 9.4 Configure CoPOS Server and option 9.5 Configure CoPOS Stations. Option 9.4 Configure CoPOS Server is used to specify the printing devices attached directly to the server. C) The Device Type (Device used to connect to the server: CoTERM, Logic Box, Other). D) The Attached Printers to a CoTERM or to a Logic Box. As with the old option Enter/Edit Device Table, there are three categories of printers to attach — System, Receipt and Label printers. These new options are much smarter about only presenting the applicable options when setting up the stations which should make this process much less complicated especially for people who are new to this option. It is now possible to set the IP Address of the attached Credit Card Reader from within CoPOS using this option. To set the IP address change the function of the CoPOS station to Register and you will be prompted to add or change the IP address of the Credit Card reader. This option lets you view a log file recording each start-of-day routine that is run on the CoPOS system. This log file can be useful for customer service tracking down issues with the CoPOS system. If an error happened in CoPOS, an entry is added to the Error Log which can also be viewed using this option. Add a pop up warning box to alert employees who are close to working overtime. If an employee has worked more than 32 hours for the week, a message is displayed when the employee clocks In. This is controlled via System Constant #214. When using option 5 View Transmission Log, you can now see a log of the dates and times that a SPINS file was attempted to be sent to SPINS. The log includes the dates covered by the file sent and a status if the file sent successfully or failed. The status of Sent or Failed is listed under the column Method. Added the ability to print out or export the security levels for employees and the security levels for options as well as the inclusions and exclusions of options. Passwords can not be exported or printed for security reasons. There is now an easy way to rename files from within CoPOS. You can specify a file source and prefix as a way to narrow down the selection. When renaming, a check for duplicate file names is made. Break pack items that are sold while being on sale (at a reduced price) and have their sale prices rounded now work properly for the “single” item sale price as well as the pack sale price. Member Only Sales are now taken for Members who have paid less than their full Equity/Dues obligations and when System Constants #88 and 89 are set to “Y”. System Constant #151, “Show Remaining available $IOU on Receipt” now works correctly when used in conjunction with System Constants #14, “Show IOU Balance on Receipt.” You can now print the IOU Balance on a receipt without printing the remaining available IOU dollars. Case pricing is now computed as the Unit Price x Qty/Case at the register when System Constant #85 (Make Case Price ALWAYS Unit Price x Qty/Case) is set to “Y”. When a Sale is suspended and than recalled from a different register and User Security is turned on, the security credentials no longer follow the sale. The recalled sale now inherits the security credentials of the current user. The [F11] Key now works correctly when attempting to view on-sale information about an item being purchased. Internal testing found a problem with using the “F*” syntax and purchasing fewer than 3 Items which we corrected. Fixed a bug where the other discount field was being incorrectly incremented when a break pack item was on sale and sold as a single. Fixed a bug where member address labels had an issue printing to a system printer from a CoTERM. Item Lists imported from CoSAT can now be used in this option. Fixed a bug where an item could be assigned a location that did not exist. Other small enhancements were made as well to help facilitate assigning locations to items. This option now correctly handles products sold by random weight units other than by the pound. Member Queries for Members with Voting Privileges now match the report in Member Voting Status. CoPOS cleared up an issue where a discrepancy occurred if the voting status was not specifically declared. These option now correctly prints small shelf tags for items with a different price for a single in a break pack item. This option now correctly displays the sale price when indicating which tags to print. Fixed an issue where changing the Purging Status to Off in the Store Settings was not being respected. The contents of an Item List can now be exported from CoSAT. The resulting export file can be opened in excel or any spreadsheet program and contains the following columns: Item Code, Item Description, Department Number, Item Cost, Item SRP, Order Entered. Fixed an issue where members who had not paid in full their equity or dues but who also were not overdue were mistakenly excluded from the Member Only Sale. This has been corrected. Fixed an issue where members who had not paid in full their equity or dues but who also were not overdue were mistakenly excluded from the Member Discounts and Pricing. This has been corrected. Whether or not the remaining available IOU dollars are displayed on the receipt is now correctly being interpreted in option 1.1 Record a Sale. Controls whether an Alert is issued at Clock In when an Employee who has worked more than 32 Hours this week attempts to Clock In. Note: You can specify the Day the Payroll Starts using Option 9.1. After you save the first part, select “MORE,” then select “Day Employee Payroll Starts.” If no Starting Day has been specified for the payroll, it is defaulted to Monday. Controls whether the default Random Weight Units are Imperial or Metric. – “COST” to specify that Items in this Department are to be sold at cost. Controls whether the Cost at which this Item is to sell is to be derived from the Item’s SRP and Margin when the Item Cost is missing. In order for this to work, System Constant #251, “Cost Plus Discounting on a per Dept Basis”must be set to “Y”. Controls whether Inventory Transfers from the retail floor and back stock (warehouse) are allowed. Controls whether the Receipt Description is used on all Repack Labels in place of the Item Description (Name). Controls whether the Transaction Log (T-LOG) data is sent to SPINS on a daily basis via FTP. As a prerequisite to using this function, System Constant #240 must be set to “Y”. Controls whether you are prompted about printing on LPQ05 Shelf Tags when electing the Standard Size Shelf Tag. Controls whether TWO weeks of sales data is sent to SPINS when sending sales data to SPINS instead of the usual ONE week. This has been added to insure that NO dates are missed when SPINS sales data is sent via FTP. If set to “Y”, a prompt will appear in Option 3.15 to print an Ingredient Only label. Controls whether the Start of Day Procedure is automatically run at 2:00AM. Having this feature addresses situation where users leave CoPOS on all night and do not log out. Doing this is contrary to CoPOS best practices. Controls whether a repayment schedule is shown on sales receipts for sales to members with an outstanding dues or equity balance. Controls whether a Items that qualify for Member Day Discounts show at the register with a sale indicator (“!”). Controls whether the ‘Sale On-Hold’ feature of the register is blocked. When this System Constant is set to “Y”, you will not be able to place Sales On Hold. This new System Constant does not block Sales from being automatically placed on hold when CTRL-C is pressed from within option 1.1 Record a Sale. Controls whether you are prompted to Batch Out the current Credit Card Batch. Note: If this System Constant is set to “Y”, you must also set System Constant #200 to “Y” in order for this feature to work. Controls whether the Cash Drawer is opened when the Money Counter is run. Controls whether the Vendor’s Order# (SKU) is printed on the Shelf Tag. If set to “Y”, the SKU is not printed on the Shelf Tag. Otherwise, it is. Controls whether Sale Tags use the verbiage “Owner” instead of “Member”. If set to “Y” the wording is “Owner” on Sale Tags. Otherwise, it is “Member”. Controls whether the IP Address of the attached PIN Pad/CC Reader can be edited from Option 9.5 (Configure CoPOS Stations). Because the incorrect setting of this IP Address can render the Credit Card Reader inoperable, we suggest that this System Constant be set to “Y”. Controls whether a clarifying prompt is issued at the register when an Item with a Break Pack Status is sold with an unqualified Quantity. This happens when the Quantity is entered as an integer. Controls whether the Singles Price of an Item placed on sale is rounded up. Controls whether the user’s initials are required when inactivating an Item. Controls whether a prompt for the UPC Codes containing a Check Digit is asked when loading Items or Sales from the Generic CoPOS Files (Items, Sales). This prompt is issued when this System Constant is set to “Y”, otherwise, it is skipped. Controls the default of the UPC Check Digit Prompt. This prompt only has relevance if System Constant #271 is set to “Y”. Controls whether Items on sale are eligible for an additional percentage off when sold to Members. Setting this System Constant to “Y” makes possible additional Member Discounts for Items on sale which can be specific to Member Types and set up in Option 4.5. CoPOS will consider discounts received in this manner to be part of the Basic Member Discounts. Click Here to download the LBMX Configuration Document. Click Here to go to the CoPOS Download Page. It has come to our attention that the format of the NCG Co-op Deals file has changed. NCG is now using a web application called LBMX to transmit Co-op Deal Flyer information to their clients. CoPOS has worked hard in the last few days to quickly engineer a new option to load this new LBMX file format directly into CoPOS. We have an interim release of CoPOS available in the CoPOS Cloud and on our website that includes this enhancement. While we have a great deal of confidence in the stability of the release, the usual testing for a public release has not been performed. There also are no attached release notes and a few options have moved. 1) Update your CoPOS system to this interim release and follow the instructions in the document, “Co-op Deals LBMX File Import for CoPOS.pdf” to process the new LBMX files. In many ways this new LBMX file is better in that you simply have to rename the LBMX file to CAPxxxxx.TXT (where “xxxxx” can be any alphanumeric character) before loading into CoPOS. No more need for Excel. To process, use CoPOS Option 8.8.1 or 8.8.2 and select the choice bar option [LBMX] when CoPOS asks for the spreadsheet source. 2) If you choose NOT to load this interim release of CoPOS, you can take the LBMX export file, which is in Tab/Text form, and load it into Excel, then cut the columns from the LBMX file and paste them into the CoPOS Standard Sales File template. This template is available on our website at www.copos.com/download. If you do use this method of loading your Co-op Deals, be sure to indicate in CoPOS that the spreadsheet source is from CoPOS. Finally, we did not receive advance notification from NCG about this file format change. Feedback from their clients about the need to communicate such changes to the vendors who service them might help to avoid a repeat performance of this situation. Release Notes covering the changes made and the bugs fixed in this interim release will be made available when we release the next official CoPOS version. Currently we expect this release to be during the middle of June 2016. Click Here to download the Release Notes as a PDF. These release notes cover all the changes made since the release of version 3.6.5A on December 1st 2015. CoPOS now has the ability to apply a store wide coupon. This means that a coupon can be setup to take, for example, $5 dollars off an entire purchase or 5% off an entire purchase. A coupon can also be configured to automatically take more money off, or a high percentage off, when the sales total reaches a predefined amount. Multiple coupons can be setup in the system at the same time. When multiple coupons are present, the cashier has the option to choose which coupon to use. The coupons are tracked as store coupons in the 3.1 Sales Recap report. There is currently no separate tracking of these coupons. All Storewide Coupons will be recorded as Store Coupons. CoPOS plans to add the ability to link these coupons to a member and have them work as part of the Basic Member Discount structure. This would allow the coupon to be taken once and only once by each co-op member during a defined time period such as every month or calendar quarter. To setup a Storewide Coupon, go to option 4.17 Storewide Coupons. To use a Storewide Coupon while in a sales transaction, type F8 for Coupons, choose [Apply Coupon] and than at the prompt, “Apply Coupon to Line#:” type in “.s” or “sale” or “all.” The F10 help text lists these options as well. Read more about this option below in the section CoPOS – New and Changed Features. Create your own custom Item Lists or Member Lists. This is a great new option that allows you to add your own unique list of members or items to a list. You can than use that list in many CoPOS options where List is one of the Selection Input Methods. Try out these new feature by going to options 4.18 and 4.19. Lists can also be deleted using these options. Returns can now be done from within option 1.1 Record a Sale. This is done by going to the Member Selection [F7] and entering “.RETURN”. When you do this, you are taken to option 1.3 Enter a Return where Items can be returned. If you get to the option Enter a Return in this manner, you are blocked from changing the Member. Currently returns done this way results in two separate tenders, one for the return and the other for the sale. At some later point, CoPOS will consider bundling these two tenders into one. For now, you can return the item as [Store Credit] and than CoPOS will immediately ask you to use that credit when you return to the sales transaction. This is a nice way to apply the money from the item returned directly to the current sale. This method uses the DBGC (Declining Balance Gift Card) feature and works well if the current member does not already have a DBGC. Member information can now be viewed much faster from within the Sales Inquiry. This is done from the [Detail] option and than selecting [View Member] when browsing sales. Items can now be added to an Item Group using a CoPOS List or the CoPOS Item Template file. A Storewide Coupon covers an entire Sale rather than just one Item. Storewide Coupons can be set up to handle absolute dollar amounts off or percentages off. At the prompt, “Apply Coupon to Line#:” enter “.S” or “SALE” or “ALL”. If there is more than one Storewide Coupon in the database, the cashier is asked to select one. Otherwise, CoPOS will automatically apply the Storewide Coupon as a Store Coupon. CoPOS applies the Storewide Coupon proportionally to all Items in the sale, so wait until all Items have been rung up to apply the Storewide Coupon. If you try to add more items, CoPOS will simply ask you to “un-apply” the Storewide Coupon before continuing. Only one Storewide Coupon can be used in a sale. Storewide coupons can be used with other coupons. View existing Item Lists, add new items to a list, delete items from a list or create a whole new list. Item Lists can also be generated from many options throughout CoPOS or imported from the CoPOS Standard Item File (CoPOS Item Template). In many options, the way to create a list is by selecting [Print/Export], then [Save List]. These lists along with the lists created in this option are available for use as a selection method throughout CoPOS. An entire list can be deleted as well. View existing Member Lists, add new members to a list, delete members from a list or create a whole new list. Member Lists can also be generated from many options throughout CoPOS or imported from the CoPOS Standard Member File (CoPOS Membership Template). In many options, the way to create a list is by selecting [Print/Export], then [Save List]. These lists, along with the lists created in this option, are available for use as a selection method throughout CoPOS. An entire list can be deleted as well. Scanning an Item UPC code in the field “Qty Counted” in this option now results in the quantity being incremented by 1 and the user returning to the field “Qty Counted”. Being able to do this speeds up counts, particularly when they are done by a single individual. This feature is available in the CoSAT option Conduct a Periodic Inventory as well. CoPOS now has a systematic way of marking Items as Out of Stock along with specifying the Date Out of Stock and the Date Expected Back. The Item Query offers the ability to query for Out of Stocks. Finally Out of Stock Tags can be printed for individual Items that are Out of Stock or en masse. Sale Tags can now be printed on CoPOS LPQ05 shelf tag stock. The correct DBGC# now shows up when looking up Customers with DBGCs. The Transaction Log now correctly reports the Sale Amount when cash is returned at the register. This fix ONLY works going forward from the date CoPOS version 3.6.5B is installed. Fixed the [Print List] option to work correctly when printing to the AUX Device while at a CoTERM. This option now respects the sort order within Departments when a separate sheet is printed for each Department. Items marked as non-discountable will NOT be discounted during Member Day Sales for both members and non-members. Sale Tags now print when a sale is to start on a future date. Future Sales can now be deleted using Option 8.10 in all situations. Scanning an Item UPC code in the field “Qty Counted” in this option now results in the quantity being incremented by 1 and the user returning to the field “Qty Counted”. Being able to do this speeds up counts, particularly when they are done by a single individual. This feature is also available in CoPOS option 6.1.2 “Enter Periodic Inventory Counts (For Individual Items)”. It is now possible to automatically print two DBGC (Declining Balance Gift Card) Receipts when entering or recharging a DBGC in option 1.1 Record a Sale or option 1.4.1 Enter/Recharge a Gift Card. Controls whether the Last 30 Days Sales or Price Changes are initially displayed in the Item Profile. There may be a short delay while CoPOS compiles Sales Data. Not all stores track Pricing Changes (See System Constant #185). Note: This System Constant controls whether the display of either occurs. System Constant #248 controls which (Last 30 Days Sales or Price Change History) is displayed. Controls what is initially displayed in the bottom right corner of the Item Profile. Item Cost or SRP Changes) should be set to “Y”. pause while CoPOS compiles sales data. Controls whether Item Ingredients can be imported from files created by CostGuard, a deli management system. In order to use this feature, System Constant #178 must be set to “Y”. The software provided by CostGuard is completely separate from CoPOS but we understand that several of our clients are using CostGuard for managing deli costs and inventories. CoPOS only uses the Ingredient (Labeling) segment of Cost Guard. These release notes cover all the changes made since the release of version 3.6.5 on November 3rd 2015. Coupon information can now be viewed for a specific item purchased in a sale. When Including or Excluding Sales with Coupons in the Sales Query, the Coupon Type (Manufacturer or Store) can now be specified. Thus it is possible to query for all sales with ONLY Store Coupons. Sales queries can now use the outputs from both Member and Item Queries. As an example, if you want to look at all the sales from members who joined in the past month, you can do a sales query and include Members. When CoPOS asks for the members to include, type “.Q” for query. If you forget, you can always use F10 for help to see this option. Now that you are in the member query, you can filter the members by “Join Dates” to get those that have recently signed up. The Transaction Log has been expanded to save 400 days of information, and now has printing and exporting capabilities. More comprehensive audit trails are directly available from this option. To view an audit trail of almost any cell on the Sales Recap Report, press the [F10] key while in the main Choice Bar. You will then see the current cell highlighted in red. Press [ENTER] to view help or [F1] to view the source of the data (the audit trail). Use the arrow keys to move to another field. This report has been expanded a great deal, and now allows for a much expanded criteria selection method as well as vastly improved options to summarize the resulting data. You can view coupon usage by department, by date, by item, and by member. In addition you can also view, print and export the totals separated by Manufacture Coupons and Store Coupons. An Item Query is now available from within the Member Query when searching for “Members Who Purchased Specific Items.” For example, to look for all the members who purchased local items, go to option 4.4 and do a Member Query and include “Members Who Purchased Specific Items.” When prompted for the item, type “.Q” to create an Item Query. The results of this Item Query will be used as the specific items searched in the Member Query. The price computed from the Price Calculator is now correctly displayed in all situations. Fixed an issue where you were unable to select items that were previously ordered and add them to the current special order. Sale Tags print correctly from Option 8.2 for Member Only Sales. Fixed an issue with printing sale tags on small shelf tags. We apologize for this temporary loss of functionality. Controls whether SPINS data is exported automatically when CoPOS is started while at the start of a weekly SPINS period. Note: In order for this to happen, System Constant #240, Allow SPINS Data to be sent via FTP, must be set to “Y”. These release notes cover all the changes made since the release of version 3.6.4 on June 4th 2015. This includes information regarding changes that were already documented in the release notes for version 3.6.4A. If upgrading from a version before 3.6.3, the CoPOS Item Template has changed. The new version is available at www.copos.com and is required for options that use this file. This new CoPOS Item Template says “Use with CoPOS v3.6.3 or Later” in the file header. Tired of printing off 10 pages of items when you only need the information on pages 3 and 4? Well, no more of that for you! CoPOS has made it possible to print a specified page or a range of pages from within a list or report. This will save both paper and time. Look for this new option the next time you go to print a report or list. Please note that most reports have been given this new functionality, if you have a favorite report that did not get updated, let us know. Thanks! CoPOS now has more ways for you to get help using F10. Ever wonder what a certain option does? Now you can read a brief summary of any option in CoPOS. Simply type in the option number followed by the F10 key instead of the ENTER key. For example, ever wonder what option 6.2 “Specify Qty Low/High Levels” is all about? Now you can type “6.2” followed by the F10 key instead of the ENTER key to read all about that option. CoPOS has expanded the usability of the help information from within CoPOS. The F10 key now works in an menu option of CoPOS. In addition to giving you help regarding the current option that you are in, F10 now gives you access to search all of the help text available in CoPOS. Simply type F10 and then chose the option [Search Help] from the Choice Bar. In addition to this feature, F10 help information is also continually being added and expanded throughout CoPOS. Remember F10 is your friend! New Notation for Faster and More Accurate Editing of Multiple Items or Members. When you have a list of items or members and you need to change a single attribute, CoPOS has long had the “*” asterisk notation which allowed you to specify the attribute to all items or members in the list. Now you can put the letter “U” or “D” to apply this attribute to this item and all the items above this item – “U” for UP or “D” for DOWN to apply this attribute to this member and all the members below this member in the list. For Example you can get a list of members sort it by their join dates and then give people who joined before Jan. 1 2015 an IOU Limit of $50 which was grandfathered in but for new members, they get the IOU limit of $30 that was recently passed by the Co-op board. CoPOS has had some requests recently to be able to print out a quick member list with contact information to make calls to members for special events or for other reasons. Now you can do this. In many of the Membership options you can now choose to [Print List] and than [Quick Member Contact List] to accomplish this task. The membership options that have been updated with this functionality include, 7.6 Member Newsletter Status, 7.7 Member Voting Status, 7.8 Patronage Distribution Method, 7.11 Overdue Members, 7.12 Member Sales By Date, 7.14 Member Sales By Volume, 7.15 New Member Signups, 7.17 Member Discounts and 7.18 Member Payments. This is a powerful new feature which has permeated most option in CoPOS. You can now use either the CoPOS Item Template file or the CoPOS Membership Template file in conjunction with most options that manipulate data in a tabular fashion. Some examples of these options include doing a multi-edit in option 4.4 “Member Enter/Edit/List/Query” where you want to change a single attribute of many members at once. Now instead of getting your list of members from a query you can get it from an excel spreadsheet. Another quick way to use this feature is to scan a list of PLUs or UPC codes in excel and than use this list in option 8.1 to check to make sure those products are indeed on sale. The files used for his new feature are available on the CoPOS website at www.copos.com/resources/templates/. The file CoPOS-Item-Template.xlsx is available on the CoPOS website at www.copos.com/resources/templates/. With this new feature you can query the information in this file just the same as you would query information in the item database. For example you can create a CoPOS Item Template file with all of the items from a particular vendor. The file could be populated by CoPOS or from a vendor catalog. You could do an Item Query in option 4.1 “Item Enter/Edit/List/Query” and query specific products from this vendor that are located in the file. In the past you could only query the item database in CoPOS. The Green Information for an item such as Local, Regional, Organic, Free Range, Fair Trade, P6 Standards, Independent and Non GMO can now be shown on the shelf tags. This Green Information is printed on the Shelf Tag in place of the Date Printed. Shelf Tags printed for Items lacking a Green Information show the Date Printed. Use System Constant 217 to enable this feature. The Weigh and Label Kiosk now has the ability to allow customers to use their own containers. “*tare” will allow customers to override the default tare of the item. To enable this feature set System Constant #125 to Yes. CoPOS is excited to announce integration with the UNFI EDI (Electronic Data Interchange) server. You can now automatically download your UNFI Invoices straight from the UNFI website into CoPOS and process them in options 8.1 Enter Item Prices or option 8.7 Process Electronic Invoices. If you are interested in this new feature, you need to contact your UNFI representative and get the login credentials for the UNFI EDI server. This will be an FTP username and password for the server ftp1.unfi.com. You add these credentials to CoPOS and the Invoices are downloaded and converted automatically into files ready to be processed. This photo shows a list of your UNFI invoices automatically downloaded and converted and ready to process in CoPOS. Members who have already taken their Basic Member Discount during the specified timeframe are now indicated as such in option 1.1 Record a Sale. It is now much easier to place a sale on Hold for a second time. This is useful when a sale is placed on Hold and than recalled and a few items are added and than the sale is placed on Hold again. You can now print a summary of a person’s IOU balance over time in option [1.1] “Record a Sale.” The summary is printed as a chit through the receipt printer. When the cashier rings up a customer with an IOU Balance, CoPOS now gives the option to print a summary of the IOU balances as a small chit on receipt paper. Leave this IOU as is. Select option 2. Print IOU Summary to see the report printed through the receipt printer. Green Attributes for an Item are now displayed when the Item is Price Checked both in option 1.1 Record a Sale and from any menu prompt. You can now search Items using the Receipt Description. To do this, prefix your response with a “R/” or “r/”. Example “R/PIZZA” returns all Items whose Receipt Description starts with “PIZZA”. The same deeper searching syntax is available here as in other Item searches. Example “R/+PIZZA” gives you all the items whose Receipt Description contains the word PIZZA. Note: This new search syntax is universal and works in other CoPOS options as well. The register is a particularly handy place to search by receipt description for those times when a customer asks a cashier to look up an item based on the receipt that they have in their hand. You can now use numerical comparisons when looking up an Item in Enter a Sale. For example, consider a Pizza that you know sells for less than $8.99, you can enter “PIZZA/<8.99”. Special Order Deposits taken at the Register and not attached to any particular Special Order can now be selectively applied to a Special Order when it is brought up at the Register or when it is entered in option 5.1 Enter (Place) a Special Order. You can use this feature when taking deposits well in advance for a particular Item. Thanksgiving turkeys come to mind. Declining Balance Gift Cards (DBGC) can now be Unlinked From a Member or Customer. This allows a store to reuse a physical CoPOS gift card. You can now easily pre-load and sell physical gift cards in CoPOS. Contact CoPOS for more information about how you can promote your co-op with physical gift cards to give away at events or sell at the registers. This can make a nice gift and can help co-op enthusiasts spread the word about your store. CoPOS keeps track of the balance and when the gift card balance is used up the card can be recharged or resold to another member. You now have a choice of displaying Register Donations as a Right Hand Column choice in the Sales Query. The Sales Query now allows for consolidation by Item, Department, Time slot, Cashier and Register#. All of these consolidations (except the Time slot) can be broken down by hourly Time slots. You can search the different transactions by time periods and a multitude of transaction types including most any transaction that involves money at the register including Sales, Voids, Returns, Declining Balance Gift Card (DBGC) Purchases, DBGC Refunds, Miscellaneous Cash Payouts, Miscellaneous R/A, IOU Payoff Via 2.7, Member Payments, Member Payments Reversal, Special Order Deposits, Special Order Deposit Refunds and Deleted Special Order Deposits. The individual who signed up a Member is now saved. This information is recorded in option 1.1 Record A Sale when signing up a member using the “*N” option from the member field. The person’s initials who signed up the new member can be now viewed in option 7.15 New Member Signup by selecting [Right Col] and than [Signed Up By]. There is also a handy new report summarizing the number of new members signed up by the cashier’s initials and date. This is option 1.29 Member Signup By Cashier. You can print this report by typing the Ctrl key and the letter P.
When editing Items in option 4.1, you can now see the current Bottle Deposit when you go to edit the deposit. The Item Query now lets you query on Restock Dates when the criteria Out of Stock is selected. You can now set the scope of the Item Query to be the Last Query run. This allows you to run a query on a query. The ability to view “Sales Tax Status” and “Item Unit(s)” also known as “Units of Sale” has been added to the available choices to view in the Rightmost or 5th Column in the option 4.1 Item Query. Multiples are indicated by a comma and will be processed as logical “ORs”. Example: An item query where selection criteria for an Item Category is “1001,1004” will result in all items that are in Categories 1001 or 1004 being presented. You can perform Member Queries with no specified criteria. This provides a de facto way to quickly view all Members. Member Contact Review status can now be changed en masse via option 4.4 using the edit multiple members, single field option. Inactive Members are now indicated with an “*” before their name when listing members using F1 or ?L functions or when looking up members by name. Note: This new notation works in other options as well where members are listed using the F1 or ?L functions. Items can now be transferred to another department en masse. This allows the Deli department to “go shopping” for ingredients and than transfer those items to the deli in one big basket. Ingredients can now be copied en masse between the two label types, Standard and Expanded. You can now use a Member File (or any list of member numbers saved in Excel) to set the scoop of the members eligible for this discount. The individual who signed up a Member is now saved. This information is recorded in option 1.1 Record A Sale when signing up a member using the “*N” option from the member field. The person’s initials who signed up the new member can be now viewed in option 7.15 New Member Signup by selecting [Right Col] and than [Signed Up By]. There is also a handy new report summarizing the number of new members signed up by the cashier’s initials and date. This is option 1.29 Member Signup By Cashier. You can print this report typing the Ctrl key and the letter P.
Figures from option 7.25 can now be made to match the figures from option 1.8 Sales Query using a new feature of Option 7.25 that lets you selectively add in the sales tax, bottle deposits and coupons. Future Pricing changes can now be set up through Option 8.1. This allows for future pricing changes to be done en masse. SRP price changes exported from CoSAT option 2.3 “Send Item Pricing File” can now be processed using this option and the item selection method of “2 … External File” and than the template type of “CoPOS Pricing.” This is an easy and quick way to process price changes made on your CoSAT unit. Items processed via the CAP flyer whose CAP sale price is in excess of an Item’s base price are now flagged. The flagging works as follows, if the CAP/TPR sales starts today or before, any item whose CAP price is in excess of the Base SRP is flagged. Otherwise, the flagging is restricted to any Item whose CAP price is in excess of 10% of the item’s base price. The 10% rule is designed to allow for future price changes that occur before the sale starts. Individuals processing the CAP file can view, print or save this list of items for use elsewhere in CoPOS. Note: The flagging happens before the sale prices are set, so if you are setting up a CAP sale for next week, you can still check if any sale prices are over your current base price by telling CoPOS to start the sale today, save the list of items and quit without saving. Items placed on sale via option 8.8.8 Process CoPOS Sale File can now be placed on a list. Items that change prices using the CoPOS Item File are now automatically saved to a list so that tags can be printed in option 8.20 Print Multiple Shelf tags. Tags can still be printed from option 8.8.9 but by using option 8.20 with a query and this list, the user has the ability to restrict which tags get printed based on such criteria such as department or date the item last sold. Shelf Tags can now be printed that show the Single Item Price for items that are set up as being Break Pack items. This new option now lets you view, print and export the price changes that have occurred in your system. To enable CoPOS to keep track of these price and cost changes, set System Constant #185, Log the last 20 Item Cost or SRP Changes to Yes. Go to Option 9.1. Save and Continue. Choose the [Day Employee Payroll Starts] selection. Specify the Day of the week the Payroll is to start or Select [REMOVE] to clear the Payroll Start Day to the default. Automatically saves a list of the items that were imported for later use in CoPOS. Lets the user REVERSE a Periodic Inventory Count. Items can now be marked as out-of-stock in CoSAT and then sent to CoPOS. In CoSAT use option 11 “Specify Out of Stock Items” and option 2.7 “Send Items Marked as Out of Stock By this CoSAT Unit” to mark items as out of stock and send these items to CoPOS. In CoPOS use option 10.5.7 “Receive Items Marked Out of Stock BY CoSAT” to import the Out of Stock status of these items. Contract Review now works correctly at the register if your intention is to continue flagging a Member already flagged for Contract Review. System Constant #89 is set to “Y”. The fifth line of the receipt message is now saved and it now prints. Member Only Sales that are blocked from overdue Members now show the correct discounting in the Member Discounts field. Prior to this fix, these sales reflected as a negative member discount in the Member Discounts field. This option now shows the correct figures when you elect to View Sales per Week for ALL Departments. Item Locations now correctly display in the Item Query when choosing the criteria Locations to Include or Exclude. Figures in the [Rightmost Column] selection of an Item Query were updated to be more accurate. The issue appeared limited to selections in Column #3 of the [Rightmost (Fifth) Column] Selection box which included Net Sales History, Returns, Spoilage (SRP) … down to Gross Profit and COGS. Origin selection is now blocked when Country/State Origin Tables are NOT built. With System Constant #190 set to Yes, the shelf tag print option now correctly prompts for the number of tags to be printed. Alternate Item ID is no longer lost when exporting and re-importing. A similar problem has been corrected when importing Item Changes from CoSAT. Fixes an issue where the senior discount was added to items on days that were not set as senior discount days. The senior discount days are set in option 9.1, Enter/Edit Store Settings and they are now respected. This option has been cleaned up a bit and now gives customers the same discount when placing a special order that they would receive at the register. If the customer places a special order for a case, which is customary for special orders, the customer receives the case discount and no other discounts. In the rare instance where a customer’s normal discount is greater than the case discount, the customer will receive their normal discount when buying a case. Help text and wording in this option has been updated and clarified to explain how the question, “Use Discount With Overdue Members” works. The answers to the question works as you would expect it to work. If a member is overdue and you answer No, then the member does NOT get the Variable Member Day discount until that member pays their membership and becomes current. Members that are marked Eligible, do not automatically get the variable member day discount. The question “Use Discounts with Overdue Members” still determines if EVERY member gets the discount or ONLY members in good standing get the discount. With the Member Day Sale set for only members in good standing, if you mark someone eligible and they are overdue, they will not get the discount until they pay up. If you mark a member as not being Eligible in the list of members than they will never get the Member Day Discount whether they are paid up, pay up during the sale or are overdue. Marking them not eligible means this sale does not apply to that member. Member Export in option 7.18 now exports correctly. Fixed an issue where a current sale would occasionally overwrite other sale prices when that sale was in the middle of a longer sale. CoPOS can now stack one sale on top of another sale. Looking an Item up by SKU now works even if the SKU is an Item Code to a different Item. Prefix the SKU code with “//” to look up an item by SKU. The alternative ID field for an item is now correctly looked at when processing items in the CAP sales file. This means that you can add the UNFI UPC codes to your bulk items in the Alternative ID field and have those items go on CAP sale automatically when importing the CAP sales file in this option. Fixed an issue where occasionally a future sale would not be remembered in CoPOS. Sale Tags now print correctly. Units of Measure now correctly align on all Shelf Tags. Alternate Item ID is no longer lost when sending items to CoSAT for other edits and than importing item changes from CoSAT. Making SRP price changes in CoSAT has been made much easier. Use CoSAT option 5 “Price Check (and Change)” or option 4 “Item Enter/Edit/List” to make the SRP price change or an item cost change. After changing the price, you can send this information back to CoPOS via CoSAT option 2.3 “Send Item Pricing File.” In CoPOS the Item Pricing File can be processed using CoPOS option 8.1 “Enter Item Prices,” the item selection method of “2 … External File” and than the template type of “CoPOS Pricing”. Controls whether sales held at one register can be recalled from a different register. Note: Setting this System Constant to “Y” increases the chances of overwriting a sale held at this register when recalling a sale from a different register. A single register can at most only have one sale on hold. Controls whether a separate line is printed on receipts each time more than one of a specific item is purchased. Having this feature enabled saves you having to figure out the unit price when processing returns when one of a lot is returned. you can see the unit price of $9.49 from the line in the receipt. Controls whether CoPOS can export SPINS data via the FTP feature of the Controller. In order for this to work, you need to set up a file path C:\IPC\SPINS. Controls whether the audio alert is issued in a different tone when a mis-ring occurs at the register. This capability is restricted to CoTERMs only. Controls whether the defaulted selection is set to “This Page” when printing a list. If “Y”, the “This Page” is the default scope. Otherwise, “ALL” is the defaulted print scope. #243 Prompt to Save Last Query when Query has NO Qualifying Items. Controls whether the Item Query prompts to save a Query even if this Query has no qualifying Items. These release notes cover all the changes made since the release of version 3.6.4 on June 4, 2015. CoPOS found a few small bugs with the 3.6.4 release. This update fixes those bugs and adds a few new features. Details below. If upgrading from a version before 3.6.3, remember that the CoPOS Item Template has changed. A new version is available at CoPOS.com. This replaces an older version and is required for options using this file to work properly. This new CoPOS Item Template says “Use with CoPOS v3.6.3 or Later” in the file header. CoPOS has expanded the usability of the help information from within CoPOS. The F10 key now works in any menu option of CoPOS. In addition to giving you help regarding the current option that you are in, F10 now gives you access to search all of the help text available in CoPOS. Simply type F10 and than chose the option [Search Help] from the Choice Bar. Give it a try, at the main menu in CoPOS hit the F10 key and choose [Search Help]. In addition to this feature, F10 help information is also continually being added and expanded throughout CoPOS. Remember F10 is your friend! Figures from a Sales Query can now be summarized by Member Type using the [More] then [Summarize] options after running a sales query. Figures from the Department Sales By Hour can now be exported. Department Sales By Hour requires System Constant #66, “Track Sales by Hour WITHIN Department” be set to Yes. Added many enhancements to this option to better see the difference made by changing margins and SRPs as well as improvements to the rounding methodology. Added a “Price Change Summary” under the [Chg All] choice bar option. Improved the printing of shelf tags to be more intuitive and useful. You can now print from a CoTERM (or Logic Box) to either the label printer attached to the server or the label printer attached to the CoTERM (or Logic Box). Allows you to search all of the help text within CoPOS. After reading about an option, CoPOS gives you the choice to run that option. This function is also accessible by typing the F10 key at any CoPOS menu. This option now prints and exports correctly. The [Merge] choice bar in the Item Category option now lets you use 8 digit codes. This is in line with the maximum length of the Item Category Code. Sorting now works correctly when viewing items in an Item Group. Fixed an introduced bug that prevented shelf tags from printing when electronic invoices were processed at the server. These release notes cover all the changes made since the release of version 3.6.3. This includes information regarding changes that were already documented in the release notes for version 3.6.3a+b as well as version 3.6.3c. Installing version 3.6.4 of CoPOS may disable some of your saved queries which are also known as existing queries. CoPOS has added new criteria in the item query and the new structure is not backward compatible. Consequently all the existing queries will need to be respecified, recompiled and saved. If you are interested in this new feature, contact CoPOS to walk you through essential procedures. From there you need to contact your UNFI representative and get the login credentials for the UNFI EDI server. This will be an FTP username and password for the server ftp1.unfi.com. You add these credentials to CoPOS and the Invoices are downloaded and converted automatically into files ready to be processed. The photo shows a list of your UNFI invoices automatically downloaded and converted and ready to process in CoPOS. As a buyer or manager you can always use whatever price point you like and CoPOS will show you what your margin will be. If your co-op is interested in using this methodology it is now available as a system wide setting in option 9.1 Store Settings or while updating prices in option 8.1 Enter Item Prices. Smart Rounding was implemented in place of $SLIP rounding which nobody seemed to be using. CoPOS has had a some requests recently to be able to print out a quick member list with contact information to make calls to members for special events or for other reasons. Now you can do this. In many of the Membership options you can now choose to [Print List] and than [Quick Member Contact List] to accomplish this task. The membership options that have been updated with this functionality include, 7.6 Member Newsletter Status, 7.7 Member Voting Status, 7.8 Patronage Distribution Method, 7.11 Overdue Members, 7.12 Member Sales By Date, 7.14 Member Sales By Volume, 7.15 New Member Signups, 7.17 Member Discounts and 7.18 Member Payments. Notes can now be attached to returns. These attached notes can then be viewed in option 1.9 Returns Query. The Declining Balance Gift Card (DBGC) used in a sale is now displayed in this option. There is a summary option called [DBGC Info] to view the details of the DBGC used in the sale. The option is under [More] in the choice bar. The sales query can now be consolidated by member. This is done by selecting the option [More] and than [Member Summary]. This new feature will easily give the ability to look up information such as how much locally sourced product did any member purchase over a given amount of time. Or what percentage of organic products did any member purchase over a given amount of time. The Declining Balance Gift Card (DBGC) used in a sale is now displayed in this option. There is a summary option called [DBGC Info] to view the details of the DBGC used in the sale. The option is under [More] in the choice bar after viewing an individual sale. Initials of the individual who collected a payment in option 2.7, Enter IOU Payments/Credits, or at the Register in option 1.1, Record A Sale, are now shown in this option when looking at the payment detail. Requires system constant 207, Require Initials When Entering IOU Payments via 2.7, be set to yes. Initials of the individual who collected a payment in option 2.7, Enter IOU Payments/Credits, or at the Register in option 1.1, Record A Sale, are now shown in this option when looking at the payment detail. Initials are also printed in the reports and exported in the file IOUPD.txt. Requires system constant 207, Require Initials When Entering IOU Payments via 2.7, be set to yes. Now prompts for the Initials of the individual who collects a payment. Requires system constant 207, Require Initials When Entering IOU Payments via 2.7, be set to yes. #66 set to Yes), the print option has been added when viewing a selected department. This option now has the capacity to toggle between displaying Inventory Information and Pricing information. Inventory information includes the number sold, Quantity On Hand and the Low Reorder Number. In order for this capacity to be realized, Active Inventory MUST be turned ON. Added a Quantity On Hand (QOH) column in the printed report when Active Inventory is turned on. It is now possible to view detail on the Monthly Sales By Department report. Simply use the choice bar option [view detail]. Brand Names are now part of the Sales (Movement) By Month export. Added the capability to filter by Member Only Sale when doing a query of items on Future Sales. Item Queries can now be run on both Existing Queries and Item Lists in addition to the Item database. This means the primary data source (the file searched first) can be either an Existing Item Query or an Item List. Items that are not in the system can be added via this option. This feature was mistakenly removed in the last release. A summary of Periodic Counts can now be viewed for Items. This report now shows the total basis dollars used to calculate the patronage distribution. This report now displays the total sales and the average net sales by month. The Price Change Summary option under the choice bar option [Chg ALL] now gives you summary information regarding the price changes that have been made. Sale Tags printed by CoPOS now show the UPC. This option can now be set to default to the current work week using System Constant 236. Restored the functionality of “C” when in any Payment field to apply the remainder to a credit cards and chose the type of credit card or debit card used. Attached bottle deposits now work correctly when returning singles of a break pack item. Fixed a rare situation where Gift Card numbers, when recharged, were lost. Fixed imbalance problems on the Sales Recap (Option 3.1) that occurred when a Declining Balance Gift Card (DBGC) created by a Patronage Distribution was deleted using this option. When creating declining balance gift cards from a member patronage file, the first member is now included. Fixed a problem with sales that were paid for by a Paper Gift Certificate that occasionally showed up as being paid for by a Declining Balance Gift Cards (DBGC). Respecifying Dates on the Sales Query now works. After you do a Sales Query, you are now able to go back and change the dates of that query without changing other search criteria. Cash Payout Notes now appear on Cash Payout Query. All the tills for the day, not just the first one, are now shown in this option. The Sales Recap export now handles missing Department Macros. Department Macros are a way of grouping Departments together. This feature is controlled via System Constant #132. If Department Macros are Enabled and the Sales Recap Export detects unmapped Departments, Department Macros are not used. Corrected the figures in option 3.2 because they did not match the Department figures in option 3.1 when option 3.2 was ran for Specific Department(s). The figures in option 3.2 were always too high for the previous year which resulted in the erosion of profit or a loss for Departments. The problem was that the previous year was set to include 1 more day. 1) Corrected a computational problem. This problem only occurred when using a Gross Sales basis and when an item was sold using a price overwrite. 2) The #Sold now displays correctly. Suppressing the date while printing a shelf tag now works. Printing a shelf tag in this option was not respecting the setting of system constant 196, Block Date on Shelf Tag. Querying for items On Current Sale with a particular sale flyer type now works. Querying for items on Future Sale now works correctly. Using the notation c#.## in the Item Price (SRP) field of option 4.1 Item Enter/Edit/List/Query now correctly updates the SRP using the current margin when answering [Yes] to the question, “Adjust SRP to Reflect Cost Change.” Example: typing “C1.10” in the Item Price (SRP) field will now correctly change the cost of the item to 1.10 and update the SRP based on the current item’s margin when directed to do so. The option [View Summary By Type] occasionally produced an error that is now fixed. Now works correctly when both current and future sales are selected for deletion. Adding a new item while doing periodic inventory on CoSAT now works. It is important to remember to import the item file from the CoSAT to the CoPOS server BEFORE transferring the periodic inventory file from the CoSAT to the CoPOS server. Controls whether customers can enter Tare Weights at the Weigh/Label Kiosk. door to theft (customers can enter an inflated Tare Weight). Controls the size of a label printed at the Weighing Kiosk. If set to “Y”, smaller labels are used. Their dimensions are 1.25″ x 1.25″. If set to “N”, larger labels are used. Their dimensions are 2″ x 1.25”. Controls the size of a label printed at the Pricing Kiosk. If set to “Y”, smaller labels are used. Their dimensions are 1.25 x 1.25″. Controls whether CoPOS can communicate with an online store. In order for this to work, you need to set up a file path C:\IPC\STORE. If this System Constant is set to “Y”, any SRP changes and all new Items will be sent to the Store when CoPOS starts up. Controls whether SRP changes that come in from electronic invoices can be blocked on a per-item basis. If this System Constant is set to “Y”, you have the capability of selectively blocking SRP changes arising from electronic invoices on a per-item basis. Otherwise, this is not possible. Controls whether the Invoice Processing Feature of the Controller is enabled. their website and place these invoices in the CoPOS Standard Invoice form. file renaming. Setting this System Constant to “Y” enables this feature. Controls whether the Item Code or receipt Description is displayed on Sales and Return Receipts. Set this System Constant to “Y” in order to have Item Codes displayed. Controls whether the “Cost” syntax is blocked when overwriting Item Prices in option 1.1, Enter a Sale. Setting this System Constant to “Y” blocks this syntax Otherwise, it is permitted. Controls whether the Declining Balance Gift Card# (DBGC) is promoted for when a new DBGC is entered. If this System Constant is set to “Y”, a prompt for the DBGC is issued. Otherwise, things work as they did before. This allows for a more intuitive way to sell physical Gift Cards with bar codes. This will prompt the user in option 1.4.1 “Enter/Recharge a Gift Card” to scan in the physical gift card instead of having CoPOS automatically assign a gift card number. Controls whether the dollar amount and percentage of local items purchased in a sale are displayed on the screen at the end of a sale. Items are marked as “Local” utilizing the green fields in option 4.1 Item Enter/Edit/List/Query. #235 Indicate Locally Sourced Items on Repack Labels. Controls whether Locally Sourced Items (Items with a Green Status that contains “L”) are indicated as such on the Repack Labels. If this System Constant is set to “Y” it supersedes the Country/State of Origin. Controls whether the Default Dates on Options 10.1.3, 10.1.5, 10.1.6 and 10.1.7 default to Today or the Current Week. Setting System Constant #236 to “Y” defaults the From and Thru Dates on the above Options to the current week. Otherwise, the From and Thru Date are defaulted to Today. Growing up with technology and touchscreens, I was a little intimidated by the basic format [of the CoPOS system], but after taking a short look, and getting the opportunity to explore the system, I quickly fell in love with its simple and straightforward set-up.